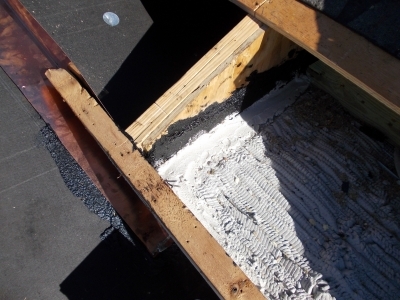 The following series of pictures depicts a typical repair we refer to as "valley base/box out". 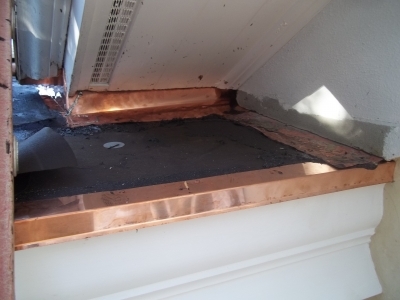 We have removed all material, exposing roof sheeting, no damaged sheeting necessary to replace. We have now verified the problem, a complete lack of flashing, look to the center left, where the soffit and fascia terminate, so does the wall flashing. 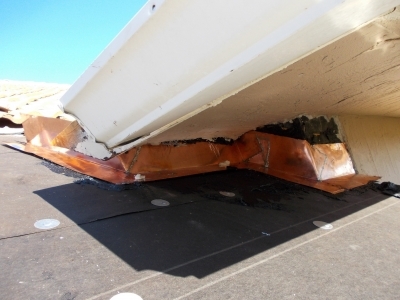 A closer look to the right, clearly defines flashing stops at the soffit line. In a couple more pictures we will show, and explain why. The mystery is unfolding here as you see and read. The picture to the left merely shows the same flashing termination at the soffit line from another perspective. The below component is secondarily as important as the flashing. We build a simple vertical wall from the lower roof to the top of the upper truss. This wall acts as a positive barrier from wind driven rains, even tropical storm winds. 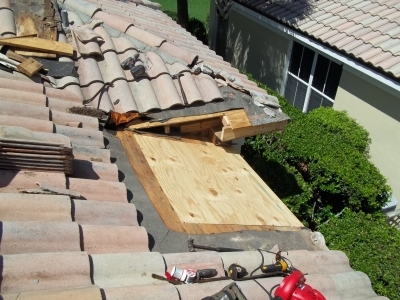 It acts as the support and sealing mechanism for the wall flashing. The mystery of which we speak? 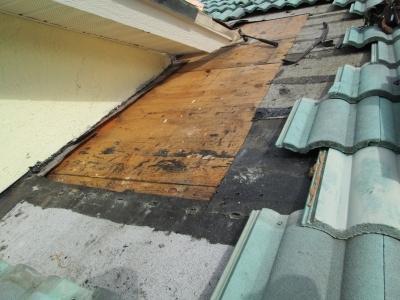 Why is this not done during new construction or re-roofing? 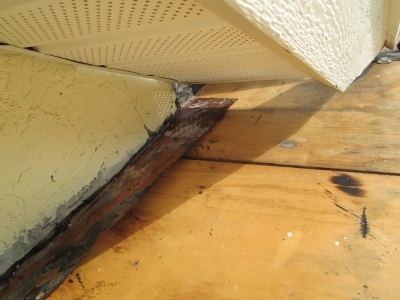 Refer back to picture # 3, how did we access the flashing under the soffit? 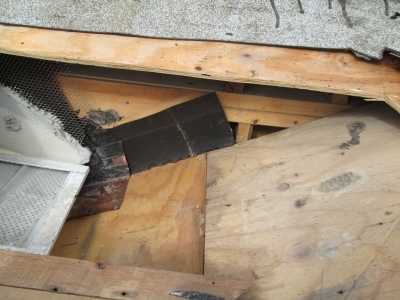 We had to remove roofing from the roof above, then cut out and remove the upper plywood. For us, Standard Operating Procedure (SOP). 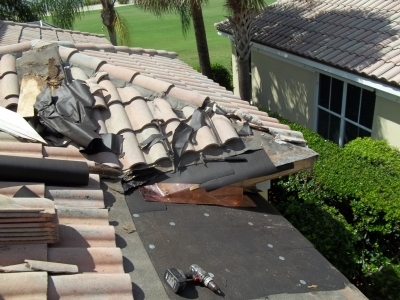 We do not deem roofing repair as a race, or a production operation, if our name is going on the customer's roof, it is going to be done right. When presenting a proposal for such a repair following replies are common. Price too high! Had someone do for much less! We did not learn this from our father's, father, etc. We developed, and teach this to our employees. Thinking out of the box, that is how we make a difference in an industry that is often indifferent, to doing things CORRECTLY. A motto used in our office! Do the job well, the money will follow! We see from much of those in the roofing and construction industry concerned more about the money. They do more for our source of work than any advertising we have ever done. 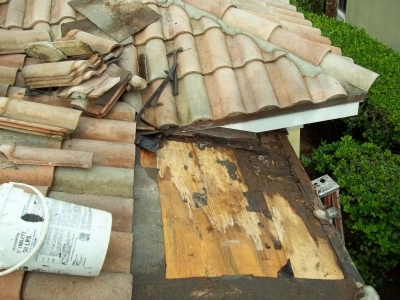 When you are ready to eliminate your roof problems, please, take the time to call our office. Thank you for taking the time to view our web site. Jim Parks & staff!